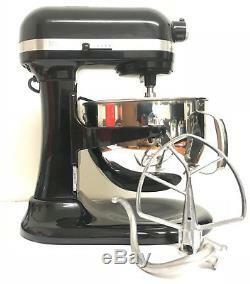 KitchenAid RKP26M1X 6 QT Pro 600 Large Capacity Stand Mixer. The Professional 600 TM has a powerful motor that is crafted for commercial-style performance, the direct drive, all-steel gear transmission delivers unyielding power for professional results. The mixer can effectively mix up to 14 cups of all-purpose flour per recipe and produce up to 8 pounds of mashed potatoes. The Soft Start mixing feature helps minimize ingredient splatter and flour puff with gentle acceleration to selected speed after start-up. Electronic Speed Sensor monitors operation to maintain precise mixer speed. Commercial-style motor protection automatically shuts off the mixer when overload is sensed to protect the motor. Durable all-steel gears provide reliable service. The mixer includes a 6-quart-capacity stainless-steel mixing bowl with a contoured handle, as well as a professional wire whip, a flat beater, and a spiral dough hook. Its multipurpose attachment hub with a hinged hub cover flips open to allow for easy installation of attachments. The Professional 600 Series bowl-lift design raises the bowl into the mixing position, and its solid, truly seamless one-piece motor head design is easy to clean and comes in a variety of fashionable colors. Rugged, die-cast all-metal construction, all-metal gears, direct drive transmission. Soft start, 10 speed slide control, 14-cup flour power, 6-quart mixing. Electronic speed sensor, multi-purpose attachment hub. 575 watt motor, locked rotary protection, 67 poing planetary mixing action. 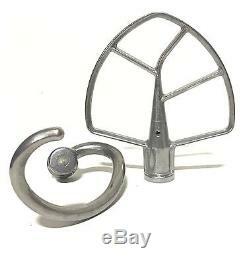 Included: wire whip, flat beater, 6 quart stainless steel bowl with contoured handle, PowerKnead spiral dough hook. Dimensions: 16.5 x 11.3 x 14.6 Measurements H: 16.5, W:11. Attn: all international customers: This item is a 110 volt item made for North American markets. PLEASE NOTE: Manufacturers often change or update product specifications without notice. Specs, features and images may vary slightly from above. NO PO BOXES, ONLY PHYSICAL ADDRESSES! This is a Certified Refurbished Unit. You may return this unit as long as it is unused and sealed inside original box. All accessories must be included inside box along with original box. Sales on the following items are final: Video Games and Accessories, Televisions, Home/Car/DJ Audio, Home & Kitchen Appliances, Personal Care and Health & Beauty, Earbuds, Headphones, Consumable, Perishable & Sensitized Items, Paper, Ink, Lamps, Bulbs, Software, Printers & Scanners, BBQ Grills, Musical Keyboards & Projector Screens(they are special order). We will reciprocate your FEEDBACK as soon as feedback is left for us. Please don't forget to leave us feedback once you receive your product. Please keep in mind that. Ommunication is the key to resolving any. So that we can resolve any issues. We will try to serve you in the best manner possible. We appreciate our customers greatly and will do anything within our power to help resolve any issues you might encounter. The item "KitchenAid RKP26M1XOB 10 Speed 6qt Pro 600 Large Capacity Stand Mixer-Onyx Black" is in sale since Friday, November 3, 2017. This item is in the category "Home & Garden\Kitchen, Dining & Bar\Small Kitchen Appliances\Countertop Mixers". The seller is "consumerbargain" and is located in Los Angeles, California. This item can be shipped to North, South, or Latin America, all countries in Europe, all countries in continental Asia.